Upon analysis, research and reflection it appears as though the game could be over in the US Bank cases, the Bank of America cases, and any case in which the foreclosing party is identified as the Trustee. 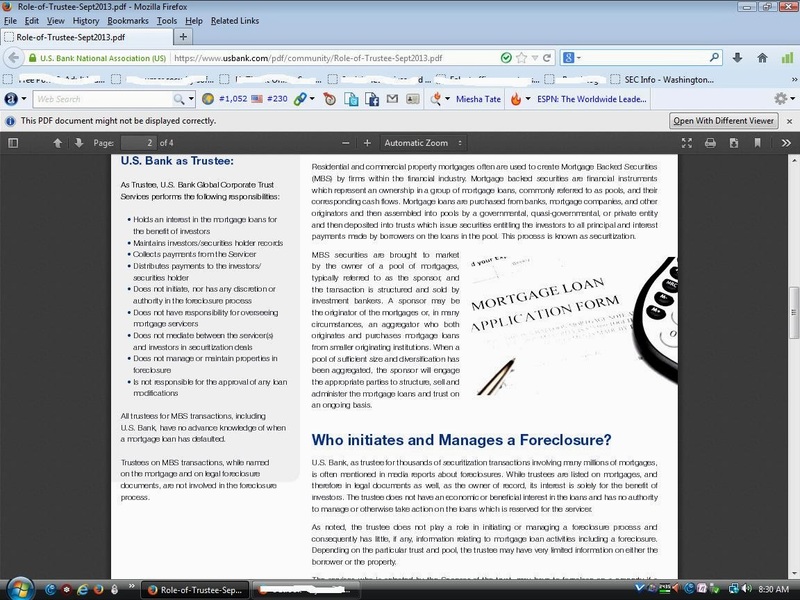 US Bank clearly has no right or even access to the foreclosure process. How do we know? Because US Bank says so on its own website. 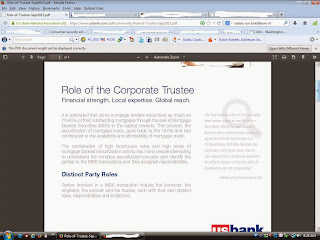 SEE https://www.usbank.com/pdf/community/Role-of-Trustee-Sept2013.pdf. “All trustees for MBS transactions, including US Bank have no advanced knowledge of when a mortgage loan has defaulted. 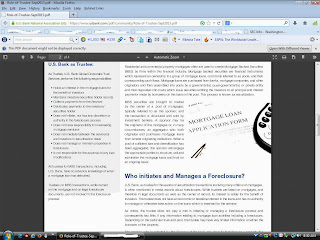 -- American Bankers Association White Paper, The Trustee’s Role in Asset-backed securities, dated November 9, 2010, http://www.aba.com/Press+Room/110910Roleofatrustee.htm "
In several cases I am litigating, the servicer seems to be saying that they approve the foreclosure but do not want the turnover of rents. This brings up the question of whether the notice of default was sent by the Trustee, who according to the attached information would not even know if the default is being "called," in which case the notice would be fatally defective. The fatal defect would be that it is not a function of the Trustee if the PSA has the usual language. That function is exclusively reserved for the Servicer. 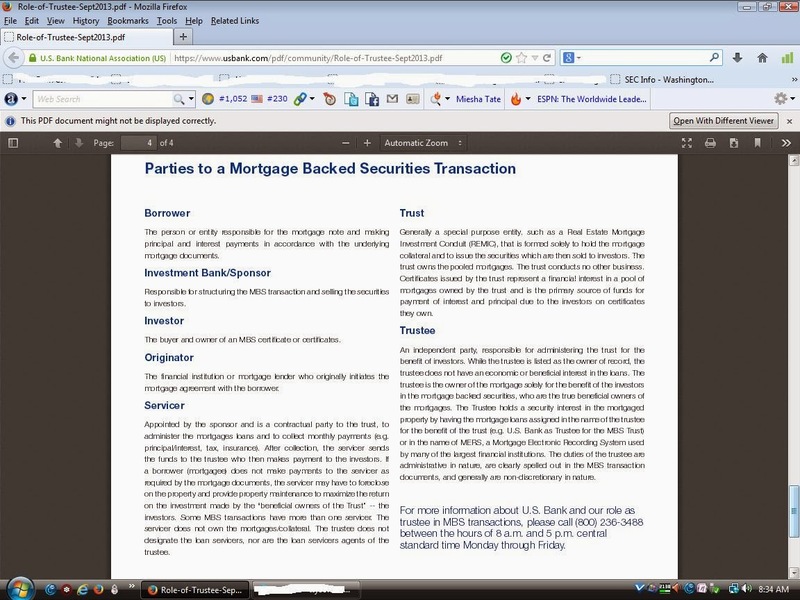 Since the PSA probably has language in it that restricts the knowledge of the Trustee to virtually zero, and certainly restricts the knowledge of the Trustee as to all receipts and disbursements processed by the sub-Servicer, the broker dealer (investment bank), and the Master Servicer. Thus the Trustee of the MBS trust is the last party on whom one could depend for information about a default --- except that if "Servicer advances" (quotations used because the money is coming from the investment bank) then the Trustee would presumably know that from the creditor's point of view, there is no default. 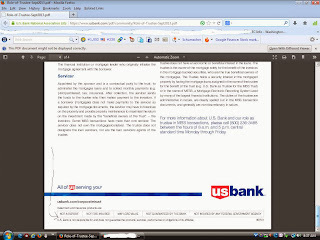 A NOTICE OF FILING could be sent to the Court with the full pdf file from the US Bank website while the smaller pdf file containing excerpts from the full pdf file could be attached as an exhibit to the Motion. THIS WILL HAVE BROAD RAMIFICATIONS FOR THOUSANDS OF FORECLOSURE CASES ACROSS THE COUNTRY. IF THE TRUSTEE INITIATED THE FORECLOSURE, EVERYTHING IS VOID, NOT VOIDABLE ACCORDING TO NEW YORK AND DELAWARE LAW. ACTIONS COULD BE BROUGHT BASED UPON JURISDICTIONAL GROUNDS FOR WRONGFUL FORECLOSURE THUS TURNING EACH FORECLOSURE CASE INTO AN ACTION FOR DAMAGES OR TO REGAIN TITLE SINCE THE SALE WAS BOGUS. But the complexity gets worse. If the action should have been brought by the servicer, but the creditor was really a funded trust who was legally represented by a properly authorized servicer, then the bid by the Trustee at the auction might have been valid. Hence the attack should be on the foreclosure process itself rather than the credit bid. Not to worry. I don't think any of the Trusts were funded --- or to put it more precisely, I have found no evidence in the public domain that any of the MBS trusts were in fact funded the way it was set forth in the prospectus and pooling and servicing agreement. 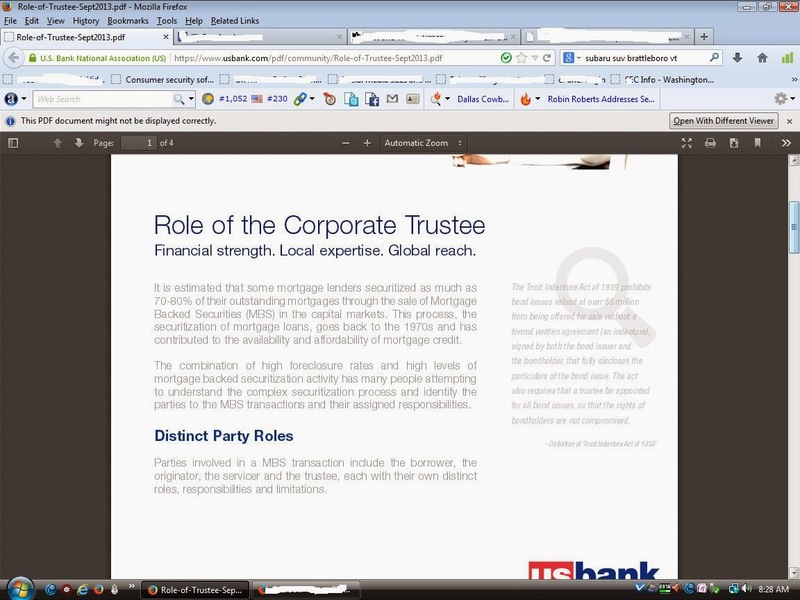 There does not appear to be any actual trust account over which the Trustee has control. Hence both the existence and capacity of the Trust and the Trustee are issues of fact that must be decided by the Court. That leaves the MBS trusts with no money to originate or acquire mortgages. So who really owns the loans? This is why in Court on appeal, the attorneys agree that they don't know who owns the loans. But what they really mean, whether they realize it or not, is that they don't know if any of the loans are secured by a perfected mortgage. If none of the parties in their "chain" actually came up with money or value, then the lien is not perfected or valid. The mortgage would be subject to nullification of the instrument. If the question was really who owns the loans, the answer is simple --- the investors who put up the money. We all know that. What they are dancing around is the real nub of the confrontation here: Since we know who put up the money and therefore who owns the loan, was there any document or event that caused the loan as owned by the investors to be secured? The answer appears to be no, which is why the investment banks are all being sued every other day for FRAUD. First they diverted the investor money from the trust and then they diverted the title from the trust beneficiaries to one of their own entities. The actions of the investment banks constitutes, in my opinion, an intervening tortious or criminal act that frustrated the intent of both the borrowers (homeowners) and the lenders (investors). So the real question is whether the Court can be used to reform the closing and create a loan agreement that is properly enforceable against lender and borrower. That appears to require the creation of an equitable mortgage, which is held in extremely low regard by courts across the country. And then you have questions like when does the mortgage begin and what happens to title with respect to intervening events? The simple answer, as I said in 2007, is do some sort of amnesty and reframe the deals to reflect economic reality allowing everyone to bite a bullet and everyone to cover their losses but avoid, at this point another 6 million families being displaced. My experience with borrowers is that the overwhelming majority would sign a new mortgage document that is enforceable together with a new note that is enforceable and leaves all issues behind even though they know they could push the issue further. The borrower s are a lot more honest and straightforward than their banker counterparts. The deal should essentially be between the investors and the homeowners. The question is whether the case is dismissed, possibly with prejudice, or if they can try to substitute the servicer as the Plaintiff in a style that would or might read "SPS, as servicer, on behalf of ??? 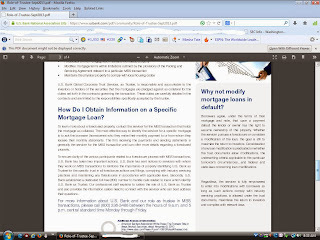 ?, Trustee for the asset backed trust" or "on behalf of the trust beneficiaries." The further question is whether the complaint could be amended. But if the servicer didn't send the NOTICE OF DEFAULT, there is nothing to amend since on its face, the Notice of Default was sent by a party who not only was not authorized to start the process but who was expressly precluded from having any knowledge of the default. This in turn leads to the further question of whether the verification was valid if signed on behalf of US Bank or any other party "as trustee" on the complaints to foreclose. 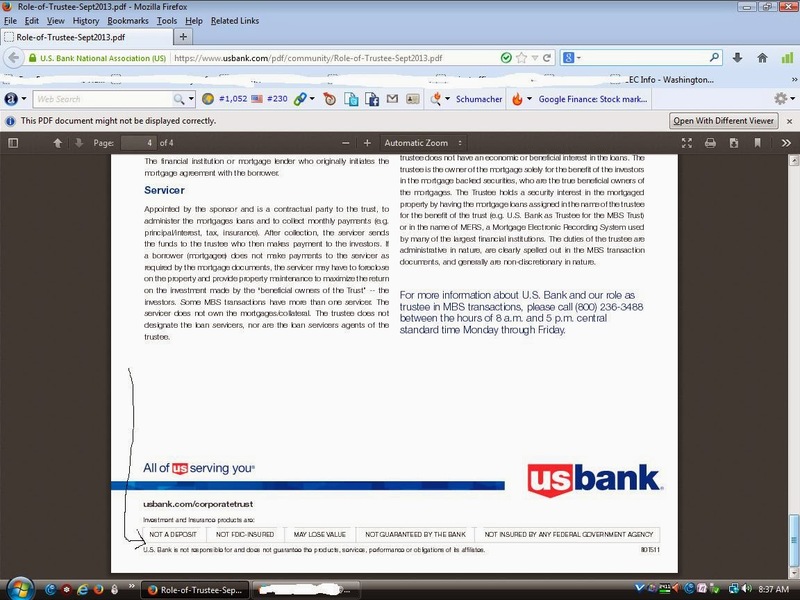 contains the Federal reserve Order approving the Bank of America - LaSalle merger. I can find no such order for the CitiMortgage-ABN Amro mortgage. It is also true that I can find no evidence that the BOA merger was completed whereas there is plenty of evidence that the Citi-ABN merger was in fact completed. 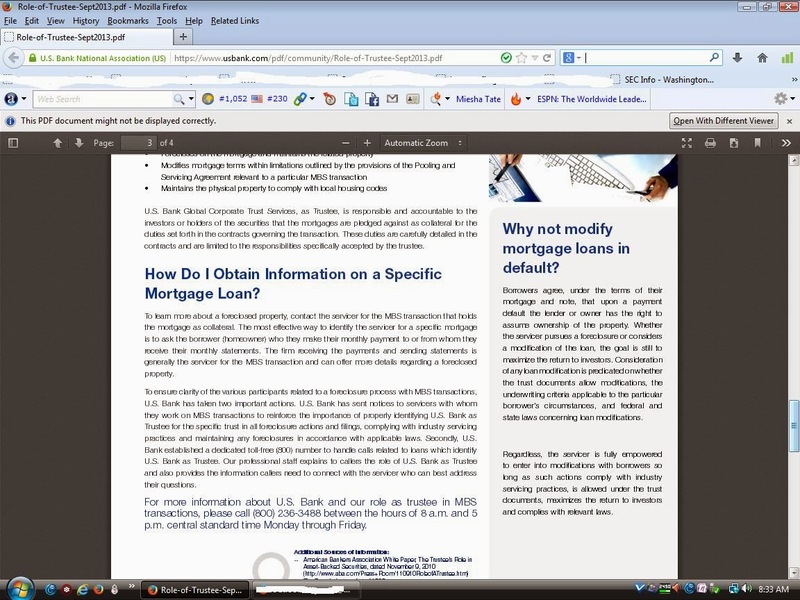 This means that CitiMortgage became the parent company of LaSalle Bank. While it is theoretically possible for an ACQUISITION of LaSalle to have taken place in which BOA acquired LaSalle Bank, no evidence exists that any such transaction exists between BofA and Citi. It is clear that Citi completed its deal in September of 2007 at around the same time that BOA was getting the approval order shown above on the federal reserve website. But most curiously the Fed does not mention the Citi-ABN Amro deal. What we know for sure is that there was no MERGER between BofA and Citi. In my opinion based upon review of this order from the Federal Reserve and other pronouncements from the FED, this order was either never officially issued in actuality or it never was used. In the absence of further contrary information which I have not been able to uncover, thus far, the irrefutable conclusion is that BOA never became the successor by merger to LASalle Bank. Therefore BOA was never the trustee for the asset backed REMIC trust. Therefore, the transaction to which US Bank refers granted US Bank nothing even if the position of trustee is determined to be a commodity --- an idea that would create havoc in the marketplace. As for whether US Bank as trustee for MBS trusts has standing, the answer is no and they have absolutely no right, obligation or even access to the foreclosure or settlement process. In the same REMIC out in California, I am the expert witness on a case in which the same trust is represented by Chase as servicer. The case has not caught up with the fact that Chase has sold or transferred servicing rights to SPS (Select Portfolio Services) or at least that is what they say. Since this information from the public domain is on the U.S. Bank website without any disclaimers, are we sure they authorized the foreclosure and the action for turnover of rents? Or are they going to say it was an error by the law firm? Who is actually the client of the opposing law firm --- the trust beneficiaries, the trust,, the trustee or US Bank who doesn't really appear to be the trustee? 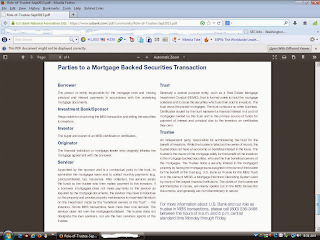 The same question could be asked of Bank of America who says they are or were a trustee based upon a dubious series of announcements that seem to lack the same underlying transactions as all securitized loans that report a transaction has taken place (i.e.., on the note the contract is implied because the borrower agrees to repay a loan to a lender that never gave them the money). Good question, any answers ? Chase Wamu Merger - Who really owns the loans? I call it fraud too ! !